The report on global collaborative robots market is an in depth analysis of the segments and sub-segments in the collaborative robots market. The report provides analysis for the global as well as regional markets over the period of 2015 to 2023. According to report the global collaborative robots market is expected to grow at a CAGR of 56.90% over the forecast period of 2017 - 2023. The report on global commercial refrigeration equipment market is an in depth analysis of the segments and sub-segments in the commercial refrigeration equipment market. The report provides analysis for the global as well as regional markets over the period of 2016 to 2024. 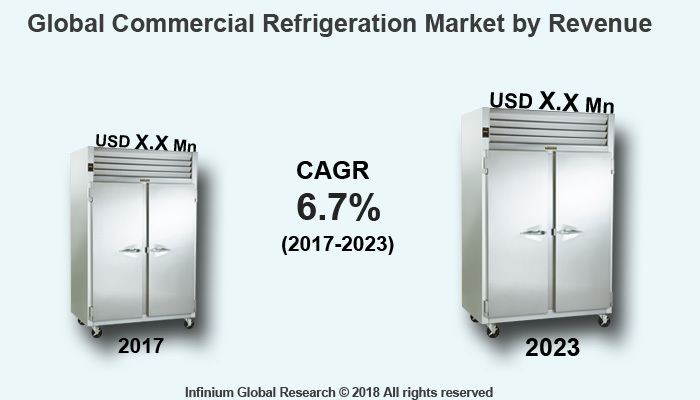 According to report the global commercial refrigeration equipment market is expected to grow at a CAGR of 7% over the forecast period of 2018 - 2024. The report on global commercial UAV market is an in depth analysis of the segments and sub-segments in the commercial UAV market. The report provides analysis for the global as well as regional markets over the period of 2015 to 2023. 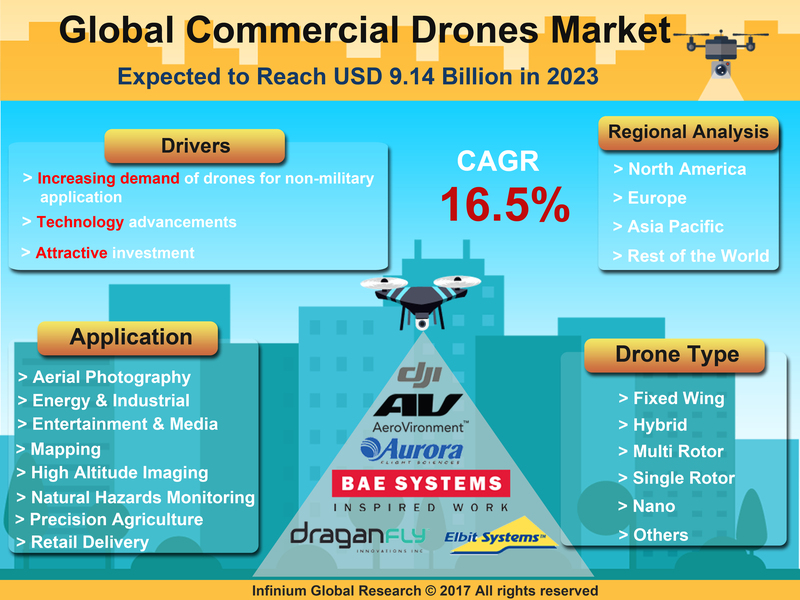 According to report the global commercial UAV market is expected to grow at a CAGR of 16% over the forecast period of 2017 - 2023. The report on global consumer network attached storage market is an in depth analysis of the segments and sub-segments in the consumer network attached storage market. The report provides analysis for the global as well as regional markets over the period of 2015 to 2023. According to report the global consumer network attached storage market is expected to grow at a CAGR of 16.3% over the forecast period of 2017 - 2023. The report on global smartphone display market is an in depth analysis of the segments and sub-segments in the smartphone display market. The report provides analysis for the global as well as regional markets over the period of 2015 to 2023. According to report the global smartphone display market is expected to grow at a CAGR of 8.1% over the forecast period of 2017 - 2023. The report on global circuit breaker & fuses market is an in depth analysis of the segments and sub-segments in the circuit breaker & fuses market. The report provides analysis for the global as well as regional markets over the period of 2015 to 2023. According to report the global circuit breaker & fuses market is expected to grow at a CAGR of 5% over the forecast period of 2017 - 2023. The report on global camera module market is an in depth analysis of the segments and sub-segments in the camera module market. The report provides analysis for the global as well as regional markets over the period of 2015 to 2023. According to report the global camera Module market is expected to grow at a CAGR between 8% over the forecast period of 2017- 2023. The report on global cloud managed services market is an in depth analysis of the segments and sub-segments in the cloud managed services market. The report provides analysis for the global as well as regional markets over the period of 2015 to 2023. According to report the global cloud managed services market is expected to grow at a CAGR of 14% over the forecast period of 2017 - 2023. The report on global cloud services brokerage market is an in depth analysis of the segments and sub-segments in the cloud services brokerage market. The report provides analysis for the global as well as regional markets over the period of 2015 to 2023. According to report the global cloud services brokerage market is expected to grow at a CAGR of 15.50% over the forecast period of 2017 - 2023. 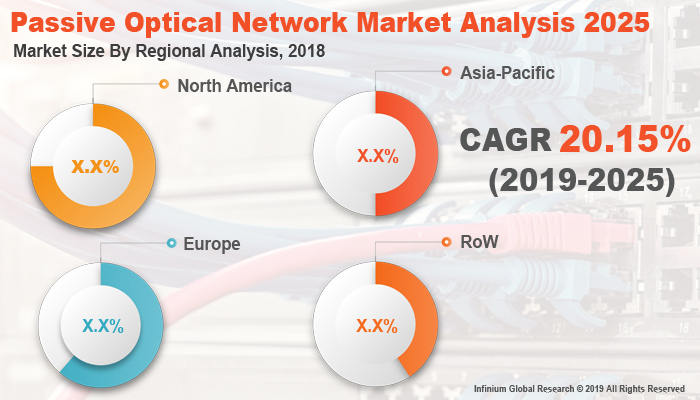 The report on global automated test equipment market is an in depth analysis of the segments and sub-segments in the automated test equipment market. The report provides analysis for the global as well as regional markets over the period of 2015 to 2023. According to report the global automated test equipment market is expected to grow at a CAGR of 3.1% over the forecast period of 2017 - 2023. The report on global Bluetooth smart and smart ready market is an in depth analysis of the segments and sub-segments in the Bluetooth smart and smart ready market .The report provides analysis for the global as well as regional markets over the period of 2015 to 2023. According to report the global Bluetooth smart and smart ready market is expected to grow at a CAGR of 2.5 % over the forecast period of 2017 - 2023. The report on global electric AC motors market is an in depth analysis of the segments and sub-segments in the electric AC motors market. The report provides analysis for the global as well as regional markets over the period of 2015 to 2023. According to report the global electric AC motors market is expected to grow at a CAGR of 6.4% over the forecast period of 2017 - 2023. The report on global electric DC motor market is an in depth analysis of the segments and sub-segments in the electric DC motor market. The report provides analysis for the global as well as regional markets over the period of 2015 to 2023. According to report the global electric DC motor market is expected to grow at a CAGR of 7.1% over the forecast period of 2017 - 2023. The report on global electric motor sales market is an in depth analysis of the segments and sub-segments in the electric motor sales market. The report provides analysis for the global as well as regional markets over the period of 2015 to 2023. According to report the global electric motor sales market is expected to grow at a CAGR of 5.3% over the forecast period of 2017 - 2023. The report on global laser processing market is an in depth analysis of the segments and sub-segments in the laser processing market. The report provides analysis for the global as well as regional markets over the period of 2015 to 2023. According to report the global laser processing market is expected to grow at a CAGR of 5.6 % over the forecast period of 2017 - 2023. The report on global power electronics market is an in depth analysis of the segments and sub-segments in the power electronics market. The report provides analysis for the global as well as regional markets over the period of 2015 to 2023. According to report the global power electronics market is expected to grow at a CAGR of 1.9 % over the forecast period of 2017 - 2023. The report on global smart electricity meters market is an in depth analysis of the segments and sub-segments in the smart electricity meters market. The report provides analysis for the global as well as regional markets over the period of 2015 to 2023. According to report the global smart electricity meters market is expected to grow at a CAGR of 9.2 % over the forecast period of 2017 - 2023. The report on global smart pole market is an in depth analysis of the segments and sub-segments in the smart pole market. The report provides analysis for the global as well as regional markets over the period of 2015 to 2023. 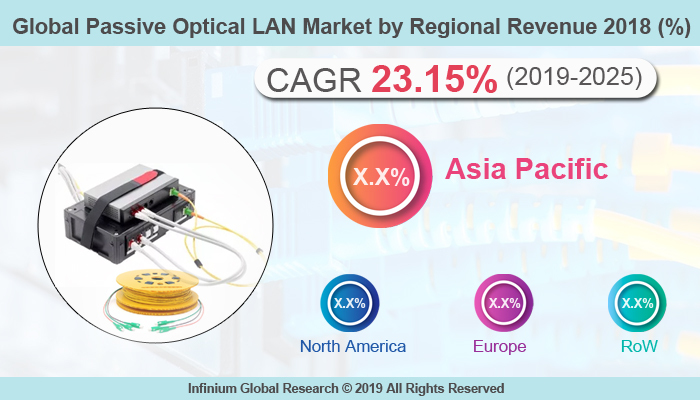 According to report the global smart pole market is expected to grow at a CAGR of 19.5 % over the forecast period of 2017 - 2023. The report on global wearable camera market is an in depth analysis of the segments and sub-segments in the wearable camera market. The report provides analysis for the global as well as regional markets over the period of 2015 to 2023. According to report the global wearable camera market is expected to grow at a CAGR of 18.5% over the forecast period of 2017 - 2023. The report on global battery managementt market is an in depth analysis of the segments and sub-segments in the battery management market. The report provides analysis for the global as well as regional markets over the period of 2015 to 2023. According to report the global battery management market is expected to grow at a CAGR of 15.5% over the forecast period of 2017 – 2023. The global agriculture drone market is driven by the factors such as increasing applications of technology in agriculture, cost- effectiveness and high efficiency of drones, and significant drop in manual labour in agriculture. However, inefficient security and privacy settings are the prime restraint that is likely to hamper the growth in the market. Application delivery network refers to a set of technologies that provides application availability, visibility, security and acceleration. Application delivery network ensures that the application is securely available across enterprise network. Moreover, application delivery network offers optimized capability to handle the demands of interactive applications. The IT enabled organizations are embracing application delivery network to effectively align with ever-changing business requirements and continuous technological innovations. The global color detection sensor market was sized over USD 1.25 billion in 2015. The global color detection sensor market is projected to grow with a CAGR between 5.5% and 6.0% during 2017-2023. Growth in industrial automation, increasing usage of color sensors in smartphones, Rising demand for processed and frozen food are the key factor driving the growth of the global color detection sensor market. Building integrated photovoltaics (BIPV) systems uses solar panels which are incorporated into buildings for electricity generation by transforming solar energy into electrical energy. In addition, BIPV products are capable of providing natural lighting, thermal insulation, structural stability and protection from water and external elements among others. Commercial refrigeration is a process by which heat is removed from a room or space to cool or freeze for storing food, beverages, medicines and other products requiring storage at specific temperatures. Commercial refrigeration systems can maintain extremely lower temperatures. Commercial refrigeration helps in maintaining the freshness and quality of the food products. The report on global 3D CAD software market is an in depth analysis of the segments and sub-segments in the 3D CAD software market. The report provides analysis for the global as well as regional markets over the period of 2015 to 2023. 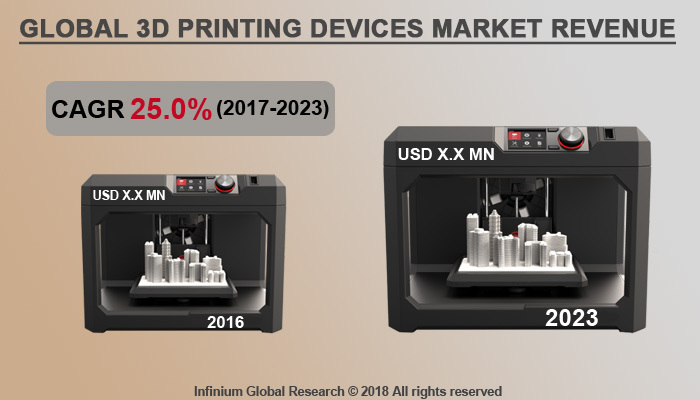 According to report the global 3D CAD software market is expected to grow at a CAGR of 67.5% over the forecast period of 2017 - 2023. The report on global 3PL market is an in depth analysis of the segments and sub-segments in the 3PL market. The report provides analysis for the global as well as regional markets over the period of 2015 to 2023. According to report the global 3PL market is expected to grow at a CAGR of 5.5% over the forecast period of 2017 - 2023.